This recipe makes perfect Crispy Sweet Potato Fries by adding one simple step before deep frying them until they are golden and crispy. DISCLAIMER: Horrible photo alert! I managed to snap this one before my family devoured them all. I'm not even publishing it full size because it's so awful. I'll update with a better photo the next time I make them...if they last long enough! Have you ever tried deep frying sweet potato fries only to have them come out either burnt tasting or simply soggy? That is what has happened to me every time I attempted to fry them. I do have a great Baked Sweet Potato Wedges recipe, but my husband loves homemade fries that are fried in oil. No the healthiest route, but oh so good. I have to admit, I love them, too. 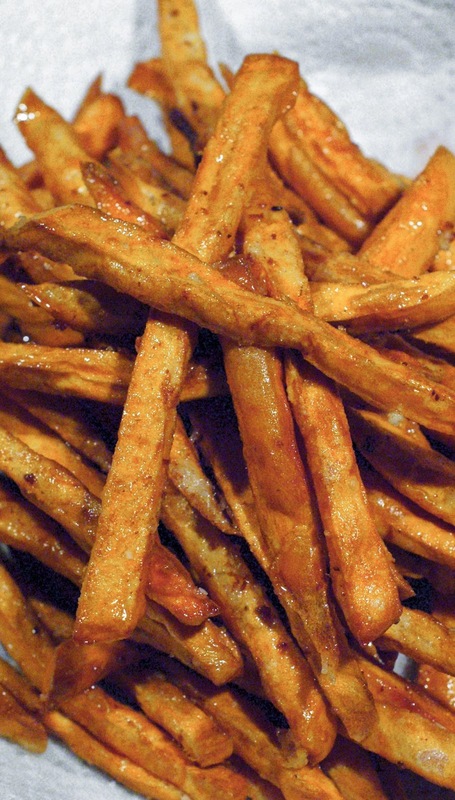 I am beyond happy that I have finally found a sweet potato fry recipe that is a forever keeper! The secret to the elusive crispiness? Dunking them in a cornstarch slurry. I know that might sound odd to some of you, but trust me on this one. These fries come out gorgeous and golden in all their crispy glory. You will not be disappointed! Heat the oil to 375 degrees in a heavy-bottomed dutch oven or deep fryer. Whisk the cornstarch and soda in a bowl. In batches, dip the fries into the batter, then place them onto a wire rack letting any excess batter drip off. Repeat with the rest of the potatoes. Fry half of the potatoes in the hot oil for 8-9 minutes or until golden and crispy, stirring occasionally. Remove from the oil and place the cooked fries onto a large paper towel-lined basket or bowl. Sprinkle with kosher salt right after they come out of the hot oil. Repeat with the remaining fries. No need to soak or par-boil these like you do for some other sweet potato fry recipes as long as you don't cut them too thick. The 1/4-inch size is key. It's super important to fry these in two batches! If you try to rush it and throw them all in at once, they'll be too crowded and not get the perfect crispness that makes them so good! Try seasoning these with any combination of spices you like. I think chili powder/smoked paprika or cinnamon/sugar would be amazing. Source: Adapted from Sweet Potato Fries found on Food Network.